The Garlic Shrimp appetizer from Taste of India on Coldwater Road. Taste of India on Coldwater Road. A piece of Tandoori Chicken from Taste of India on Coldwater Road. Naan bread from Taste of India on Coldwater Road. Keema naan bread from Taste of India on Coldwater Road. Plain Rava Dosa bread from Taste of India on Coldwater Road. Chana Saag -- spinach and chick peas -- from Taste of India on Coldwater Road. Lamb Rogan Jose from Taste of India on Coldwater Road. The unassuming little place in the Coldwater Crossing shopping center along Coldwater Road has chugged along more than 13 years with little fanfare as stores around it have come and gone. Heck, even a large section of the shopping center is gone, having been leveled in 2017. But Taste of India remains and its legion of fans still keep it busy. It always feels good to walk into a busy restaurant because it assures you that something good is happening. 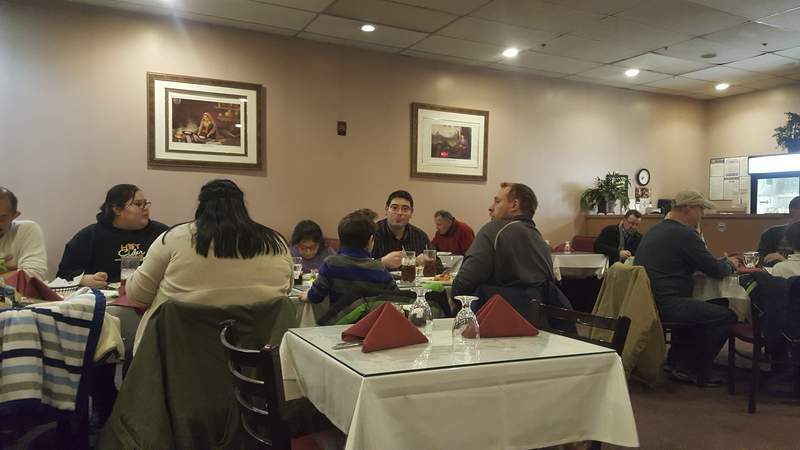 When I walked into Taste of India for my most recent visits, this feeling was strengthened by the large tables – one with nearly 20 customers – filled by Indian families who I would assume have a high expectation for their native cuisine. Like most Indian restaurants, Taste of India's buffet, which is always available at lunch and for dinner on the weekend, gets the most attention. But there is a full menu that you should dive into before just settling for the buffet because the best food I had there came from it. Whether you opt for the buffet or the menu, a basket or two of naan bread or dosa bread is a must. All of the varieties I tried were top-notch. 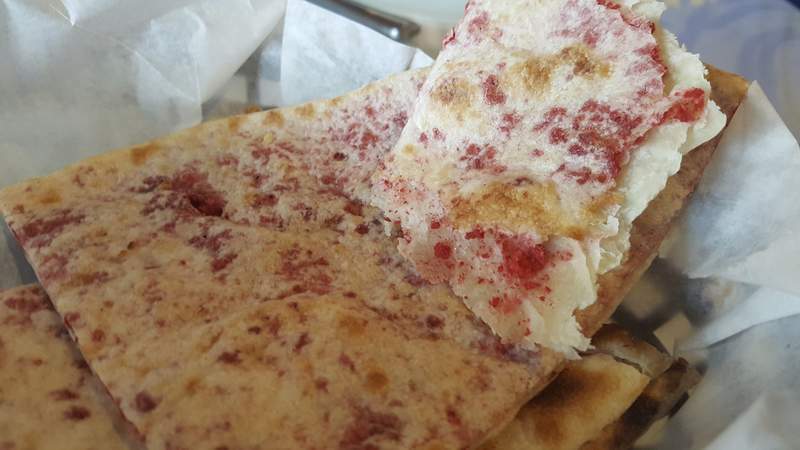 The regular naan, which buffet diners also receive, was light, soft and perfectly executed. When it is this good, I have been known to order basket after basket, and I, indeed, had more than one during each of my visits to Taste of India. 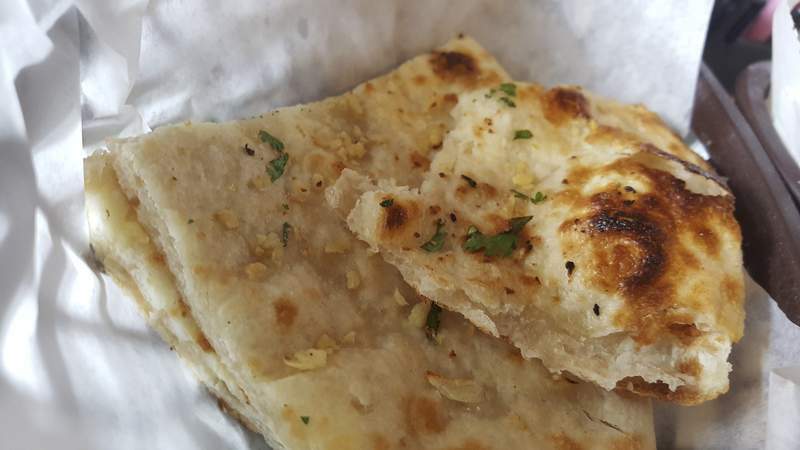 I also liked the Keema Naan, described as “stuffed with mildly spiced lamb” on the menu. It was dotted with the bright red bits of lamb instead of being truly stuffed, but it was soft and fresh like the regular and I enjoyed it. 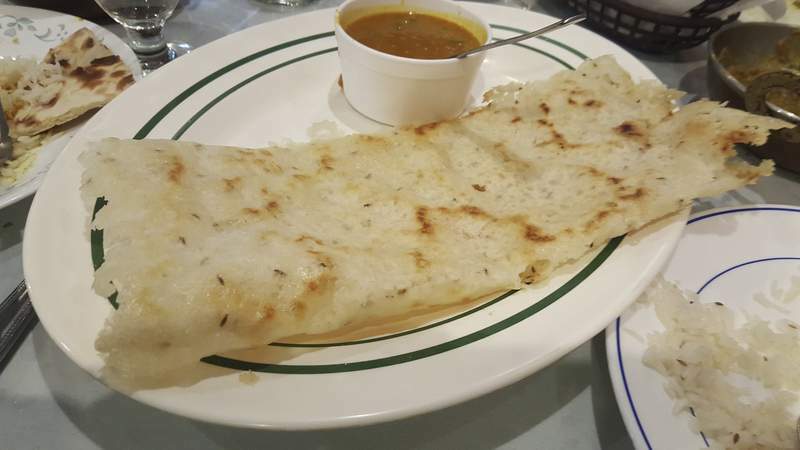 The plain rava dosa was much thinner and lighter – more like a crepe – than the naan. It is made with granulated wheat and was much crisper than I expected. Only the center was soft. It was quite tasty with fennel seeds being the only visible spices dotting it. It was served with a little container of sambar – a lentil and vegetable stew – for dipping, which was the best part. Another great appetizer that would find favor with those who are intimidated by the exoticness of Indian food was the garlic shrimp. Its aroma punched me in the face as soon as it hit the table and it smelled a lot like good ol' chicken wings. 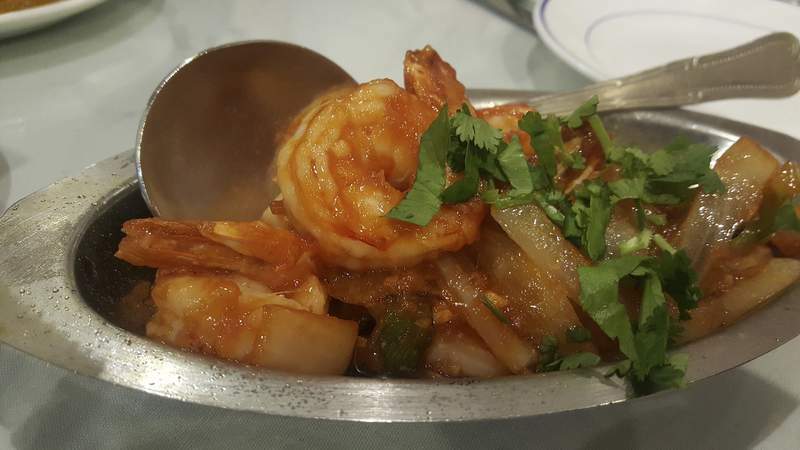 The five big shrimp were coated in slightly spicy, slightly sweet red sauce with stewed onions and garnished with fresh herbs. The only flaw was that there were five shrimp because the odd number meant I was going to have to fight someone for the extra one if I was sharing it. There were great finds on the buffet and some items that reminded me of why I dislike buffets so much. The best bet, whether on the buffet or on the menu, was to go vegetarian. The aloo gobi masala on the buffet featured mild curry-spiced cauliflower and potatoes that offered textural diversity as the cauliflower still snapped while the potatoes were cooked through. The spice level was perfect so it was interesting without being too hot for those timid when it comes to spice. The mushroom mutter – peas and mushrooms in a creamy tomato sauce – was another brilliant buffet vegetable item. It had an earthy, umami flavor from the mushrooms and the bright green peas provided a kiss of sweetness to the savory dish. 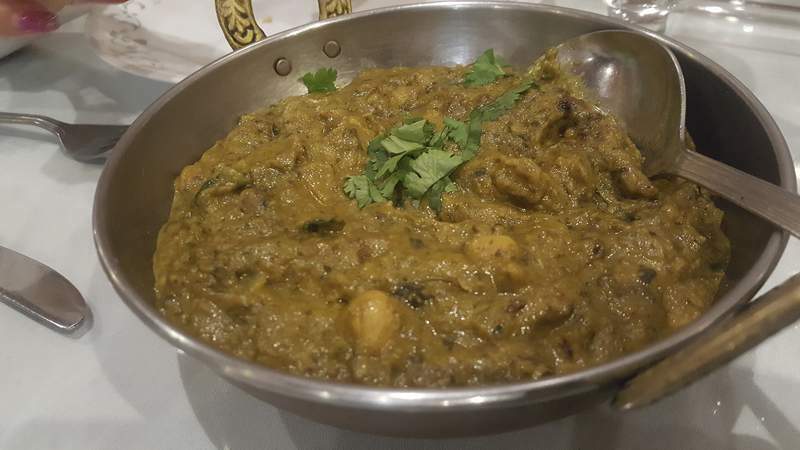 The chana saag – chickpeas cooked in a creamy spinach sauce – that I ordered from the menu was by far the best dish I had at Taste of India. It was luxurious in its creaminess, rich like good steakhouse creamed spinach and the chickpeas were firm and starchy like potatoes. It had an intense flavor that I loved and kept me coming back again and again. The chicken tikka masala and chicken curry on the buffet were not up to snuff. The sauces were rather bland and they lacked the kind of vibrancy I expect from good Indian food. The chicken breast pieces also were overcooked and dried out. The best buffet dish for someone uneasy about trying exotic Indian offerings, the tandoori chicken, also fell flat. 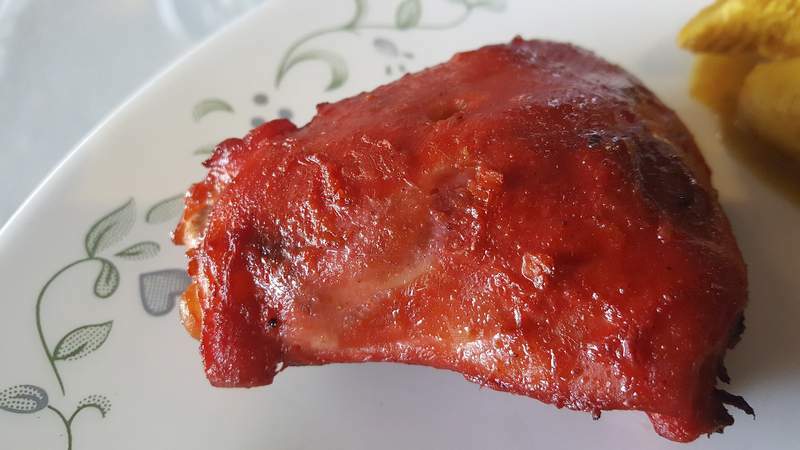 The leg and thigh pieces had the signature bright red hue and the meat was plenty juicy, but, again, it was bland. The mix of salty, spicy and slightly sweet flavors this chicken usually gets from its marinade was just not all there. 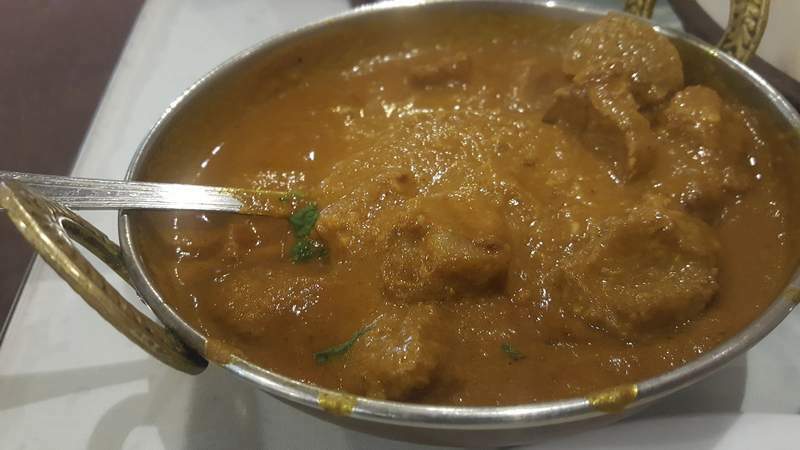 I did enjoy the lamb saag from the buffet as its cubes of meat were very tender and juicy, and it had a tingly spice and subtle smokiness I loved. Not surprisingly, lamb was at the heart of the best meat dish I ordered from the menu. The lamb rogan josh featured tenderloin cooked in spices with onion and tomatoes. I asked for mine hot and was obliged, and the tenderloin, though well done, was even more tender than the buffet lamb. It also had a more robust flavor so it was clear this was lamb you were eating. There was a slight smokiness to its thick, hearty sauce – made with cashew paste – and chunks of tomato here and there to provide relief from the spice. It was the perfect dish for a winter and the kind of dish that made it clear ordering from the menu was well worth it. 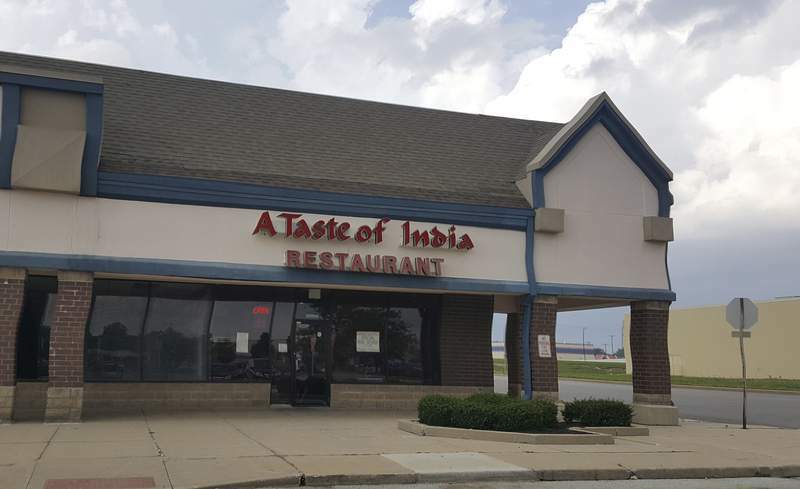 Visiting Taste of India is also well worth it, especially if you live on the north side of this city, which has just one other Indian restaurant. It isn't flashy in terms of decor, which kind of matches its quiet existence over the years. The service was good but not exceptional.